And on the eighth day, God said, “Let there be Red”…. And from the moment Major League Soccer announced the awarding of a new franchise to Maple Leaf Sport and Entertainment in 2005, the many life long football fans hibernating in the Toronto soccer “underground” came to the surface and the buzz began. It wasn’t long after the team was officially named, and the new logo presented for the first time in May of 2006, that a gentleman in England known only as “Simon”, started a discussion group on-line to talk up the new team. From those humble beginnings the seeds of our club were formed, and a meeting was called amongst the local members of that discussion group, with the specific purpose of forming a proper supporters club. The first ever meeting was held on September 29, 2006 at Toronto’s “Overdraft” pub with representatives from TFC on hand. Prior to that historic meeting the group had decided to use the name “Red Patch Boys”, in homage to the veterans of the “1st Canadian Infantry Division” of the Second World War. This unit was referred to as the “Red Patch Devils” by axis troops in recognition of their bravery and perseverance in the face of heavy combat. The founding members felt that a name honouring this illustrious fighting unit could be worn as a symbol of pride for our country, our city, and our newfound team. As well the new group hoped to emulate the camaraderie and fellowship exhibited by our soldiers in arms. The name was modified to its current incarnation so as not to be mistaken with the popular nickname of the Manchester United supporters group, “The Red Devils”. 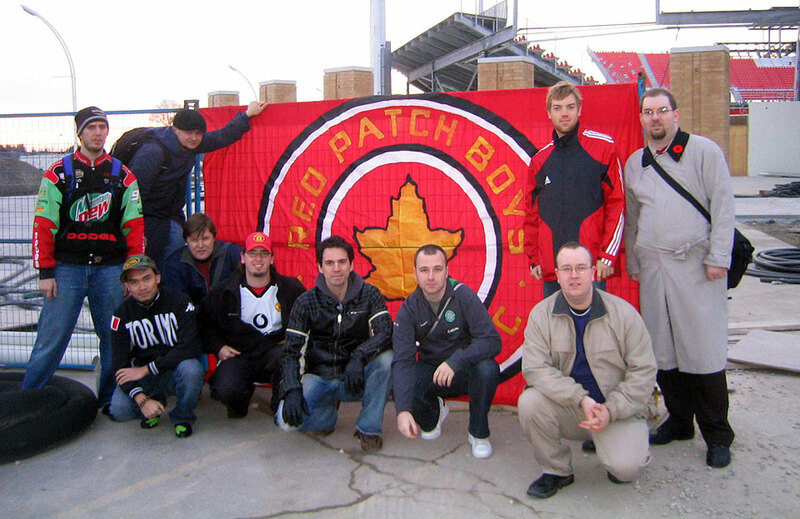 The 2007 season saw the group rapidly expand as a “supporters culture” began to take over BMO Field. Sections 112 and 111 were designated “supporters sections” by the club and held for our members to purchase seats prior to going on sale to the general public. These sections affectionately became known as “The Bunker” due to the relatively high number of RPB members in each section. Fellow supporters group “U-Sector” were to be situated close by in section 113. The first RPB “Bunker Banner” that hangs so prominently in front of section 112 was designed and put together by hand by a group that included; Mike Dubrick, Dave Strasser, Anton Scheglov and Myron Rabadon.